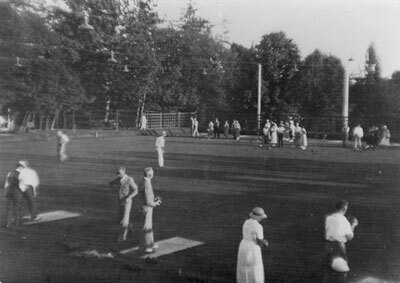 The West Vancouver Lawn Bowling Club playing on the green. Scanned January 2012 using Epson Perfection V700 Photo at 300dpi and 100% of original image size. Alternate Versions: Lossless TIF from original scan at 300dpi and 100% of original slide. W17.5 x H12.5 cm sepia print on photo paper.